This is part 2 and for part 1 see here. Completing our mountain wilderness adventure involves bundu bashing on foot. If you want to see how we got to the Outeniquas in the first story, then read here..
Hidden away in this Outeniqua Mountain wilderness; another realm of nature waits for us. First off, the terrain is very different to the fairly flat Savannah we usually encounter. Wild and unfamiliar is the attraction and also part of the problem; to really “see” the cast of this local show means lacing up the hiking boots and saddling up “shanks pony”. Down in the forested valleys; patches of indigenous bush and trees are home to African Leopard, Chacma Baboons, Bushbuck, Blue duiker, Cape Grysbok and Bush pig, along with reptiles, small mammals and hundreds of bird species. These forests also provide shelter to the famous, elusive and possibly extinct, Knysna Forest Elephants. In this mountain wilderness there’s not much sun getting through into the valleys and they stay damp, moist, and fertile. The water and mud we had driven through can take several days to dry out, whereas up here, the tracks are already dusty after a few short hours of sun. As the altitude increases, the indigenous forest gives way to timber plantations. 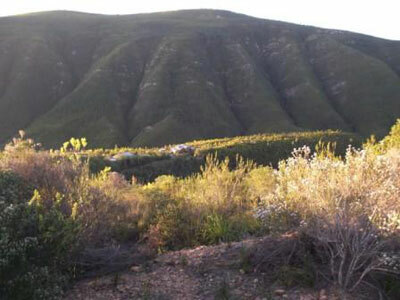 Scraps of natural undergrowth and patches of native heath-land vegetation (fynbos) surround these alien islands. The protected Fynbos occurs in small patches of the Western Cape, mainly in coastal and mountain areas with a winter rainfall. 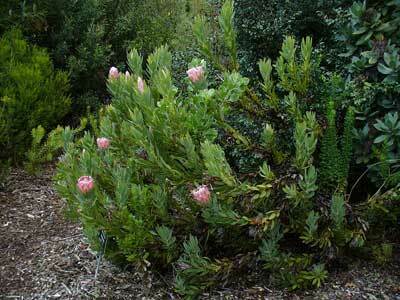 Erica and Protea fynbos take over up on the mountain ridges and peaks with elevations above three-hundred meters and more. 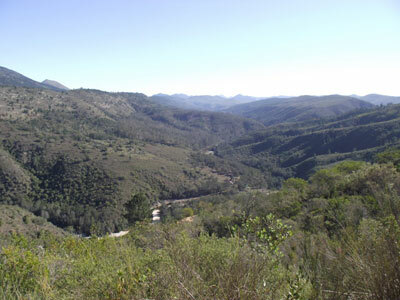 The wildlife in these mountain habitats includes bees, beetles, horseflies and ants, and birds such as Cape Sugarbirds and the Orange-breasted Sunbird. Many of these birds and insects are important and specific pollinators for the fynbos. For an example, the Mountain Pride butterfly, only visits red flowers and pollinates 15 different species. Astonishing, how does a butterfly know if a flower is red – they can’t be colour blind? Did you know butterflies supposedly have the broadest visual range of any form of wildlife? I didn’t… Have you ever approached a butterfly from behind, only to see it fly away as you reach it. Now you know why. Here at the higher altitudes, Genet and Cape Eagle Owl join the Baboons, African Leopard, Common Duiker, Imbabala (Xhosa name for Bushbuck) and Blue Duiker. The Elephants and Bush pig stay in the forests, preferring cover. So, with no big five (only leopard) to get in the way of a good ramble, we set off after breakfast to explore the mountain wilderness. The river was our goal, a few hundred meters along a very steep path, off the edge of the garden. On the way down, we passed a mountain spring, bubbling up through big stones. This clean pure water, filtered through layers of mountain rock and augments the flow from the river and supplies the house. Useful to have when unusually heavy rainfall (with snow) causes flooding and heavy debris in the river itself. The banks of the tributary widen out, just below this point, providing a spot for a small patch of indigenous forest and the homestead vegetable garden. This is a garden in a cage, covered on all sides. But the cage doesn’t work so well as yet. Baboons raid the fertile spot regularly and always take the best of the fruit and vegetables. We stayed in the mountains two days longer than we intended…Any longer, and I don’t think we’d have got out. Something in this mountain wilderness touched something primal, deep inside us. Life was reduced to food and shelter and all else is so far removed from reality, that little besides seemed of much consequence. I don’t think we’ll get D and P visiting our side of the country too soon. They stay cloistered in their mountain hideaway, custodians of their fauna and flora. P feeds the wild birds that frequent the garden. The braver ones have free range of the house, knowing there will be tidbits to find and they fly in and out freely. We got used to finding strange birds rootling around the breakfast table and in the dog bowl. This doesn’t seem to bother the resident canine – he’s as laid back as his people. We drove around once or twice, exploring the terrain and enjoying the fynbos as the proteas came into flower…But despite our hopes of bundu to bash, the ‘cruiser had a holiday. Most of the bundu bashing was done on foot. All the proteas and bushy plants made game viewing an exercise in tracking. 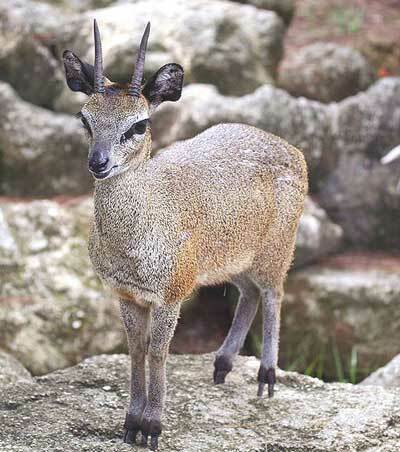 Then most game here is quite small, a Cape Grysbok is only about 20 inches tall, the Common Duiker about the same, with the Klipspringer (shoulder height 21 – 22 inches) the largest of the three. Hard to spot! Waking up every day in this gigantic natural garden – mile upon mile of flowering shrubs and bushes, was awesome. As the sun spread across the countryside, steam would rise from plants dripping with dew, releasing sweet odours everywhere. Going out beyond the planted garden, boots crunching on gravel, and the dirt tracks showed who (or what) had been active during the night. The weather stayed brilliant, all the stormy petulance and freezing tantrums gone. Night skies, sharp and clear gave way to days so bright they hurt the unprotected eye. Early morning and dusk were the most successful times of the day to see game (this is true all over). The smaller creatures, scurrying about everywhere, were harder to spot but they at least gave us a chance by being around most of the day. This great garden was alive with life everywhere. We never did see the baboons that gave me such a fright, although evidence of their activity was all around us; missing vegetables, droppings on the ground, tracks in the sand and their barking cry heard in the distance. 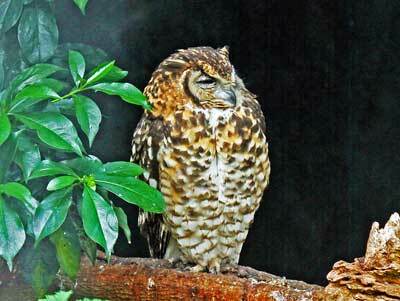 After dark, Cape Eagle owls hunted near the house, using the roof as a rest stop. 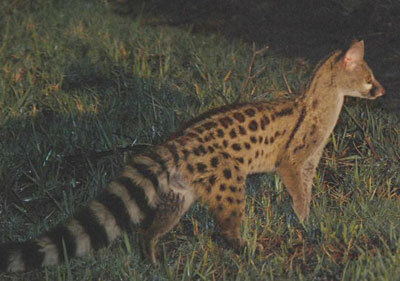 Nightfall also brought the stealthy Genets, hiding around the shadows, hunting rodents, and the nights were almost as busy as the days. And, as happens with all the paradises we visit, we eventually had to leave this mountain wilderness, back to the realities of our lives. With the ‘cruiser packed and plenty of daylight, we set off early one morning to tackle the tracks and trails back to the Plettenberg Bay road. On the good side of noon, there was time to stop and poke around the riverbanks and enjoy the natural forests and the trip passed all too quickly.